This weeks topic in epistemologies was constructivism. The readings, including the first chapter of Denzin and Lincoln’s “Strategies of qualitative inquiry” (2008), talked more about qualitative research than constructivism. Fortunately, I’m familiar with constructivism from learning theory, and the epistemology, although different, shares many of the same ideas. One observation that I made last during my Qualitative research course back in January, and made again when doing this week’s reading is that some of the terms used in qualitative research meant the opposite of what I expected them to mean. I see that this is an example that of what was mentioned in last week’s readings, where we may be using the same terminology but the meaning is different, such that we are not effectively communicating. The two terms that I mistook were “triangulation” and “grounded-theory”. When I first heard the term triangulation, I related it to coastal navigation (as in navigating boats). In navigation, triangulation refers to taking the bearings of three objects, such that the intersection (or triangle) created by the barring lines is used to make a best guess about your location at the time of bearing. In qualitative research, triangulation is about understanding different perspectives. There is a fundamentally different world-view between navigation practice and qualitative research. In navigation, you assume there is only “one answer”. You can think of navigation practice as taking a positivism world-view, and as a result, triangulation is trying to find the one answer (you can’t be in two places at the same time). In qualitative research, using the constructivist world-view where there isn’t a single truth, rather all truth is relative and constructed by the individual or society, triangulation refers to finding and documenting the different perspectives. So in navigation, the intention is to find the single truth and in qualitative research it is about finding the different perspectives. Interestingly, both are seeking to measure validity. The next term that I found to mean the opposite is “grounded-theory”. When I first heard of grounded-theory, I thought of research that is grounded-in-theory. Again, I was thinking from a positivist perspective, where you apply theory to determine a hypothesis to test, that is, you use a theoretical lens to predict what you see in the world. Qualitative grounded-theory is exactly the opposite. In grounded-theory you examine the data to try to extract a theory. It is a process of discovery rather than confirmation. So rather than having a theory and testing it with data (positivist), you have data and you attempt to extract theory (qualitative/constructivist). What is interesting is that I see value in both perspectives. I am definitely confirming myself as a mixed-methods gal, as I see qualitative research to be rich in description and the best method for discovery of and innovation, two things that I value highly. However, I cannot easily dismiss my positivist upbringing, and the desire to use quantitative methods as a means of validation of theories. Denzin and Lincoln’s chapter dismissed mixed-methods research outright, as a methodology that bastardizes qualitative research methods and prioritizes the quantitative component of mixed methods. I was left feeling that the authors were not familiar with recent developments in mixed-methods research, and they would benefit from reading at least some of Creswell & Plano-Clark’s (2011) “Designing and Conducting Mixed-Methods Research”. When I teach and when I learn, I much prefer a social-constructivist learning environment. I know that I learn through dialogue, however, I don’t see myself buying into the epistemology behind the learning theory. I currently see myself as someone who teaches using social-constructivism, whose epistemological beliefs are positivist, and whose research methodology is mixed-methods. You see, although I can relate to the positivist world-view of a single “reality” that we all share, I don’t think that quantitative research is the only appropriate methodology. I see value in qualitative research methods. 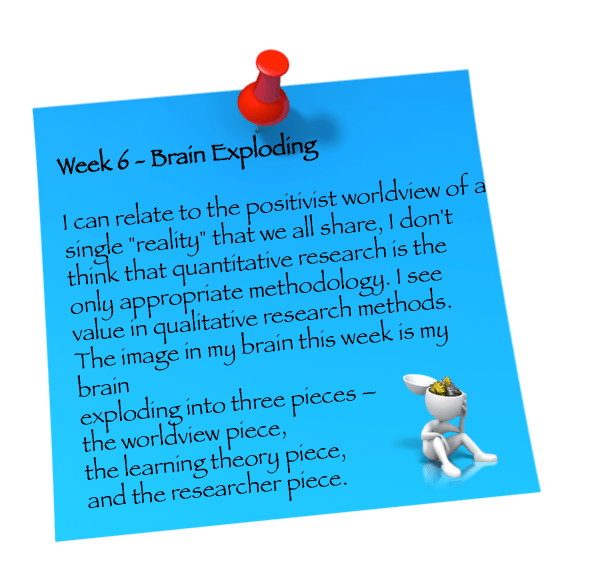 I think the image in my brain this week should be of my brain exploding into three pieces – the world-view piece, the learning theory piece, and the research piece. What do you think, does your world-view need to align with the way you do research and the way your teach? Creswell, J. W., & Plano Clark, V. L. (2011). Designing and conducting mixed methods research (2nd ed.). Thousand Oaks, CA, USA: Sage Publications Inc.
For Nancy: Are you suggesting the feminist approach? Yes, too am unable to remove myself from the subject of study. The above reference talks about how ppl doing qualitative research can come from different worldviews/paradigms: positivist, interprerive, critical – and when they do research using qualitative methods, they measure the quality differently. I added to the great table in that article some other measures of validity of qualitstive research (well, more recent developments eschew the term validity in the first place. But i think Creswell and Miller come from the positivist camp (if my memory serves me right) so they’re not in that camp. I think that article is a good read for any social science researcher. It helped me a lot in terms of clarifying to readers how I considered the quality of my own research. Teaching is such a personal experience for me, that I don't feel I connect with my students unless my "self" is expressed, which includes my world-view. Anything less, and I am just delivering content like the pitcher filling the student's empty glass of knowledge. I can do it, but it feels very mechanical and I don't enjoy it very much. Hi Nancy, my name is Jacky and I’m currently participating the cource of Qualitative Learning and found it to be very intersting althoug its the beging. I total understand your conception of the Q.L as an approach, yes you must iteract closly with the class in order to pass or receive a complet massage. That how you turn a dry learing material into intelectual growth.